Processing parts of wooden buildings by robots and computerized numerical control (CNC) machines has been attempted in recent years. However, the shapes of the processed parts are constrained by the machines and attached tools. Modified parts cannot be applied to traditional wooden buildings, as the shapes of the parts are an aspect of the tradition. 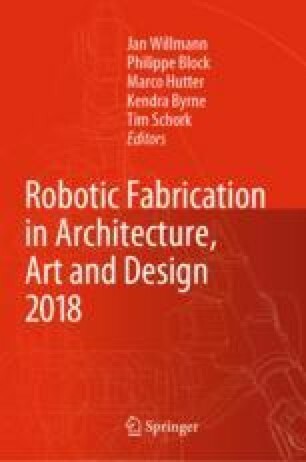 This paper introduces a method of versatile processing of wooden building parts using an articulated robot, based on the analysis of part shape and carpentry tools used in Japanese wooden building construction. The goal is to process the original part shape of the construction method as is, without optimizing it for the robot and machining. We analyze Japanese carpentry tools and processing methods and propose a method to flexibly process wooden building parts using a circular saw, square chisel, vibration chisel, and router. Then, using robots employing these tools, we process parts of a five-storied pagoda of a Japanese traditional wooden building. We consider flexible processing of the wooden building parts. This work was supported by a JSPS Grant-in-Aid for JSPS Research Fellow grant number 16J02060.